Introducing Android Material Design 2.0 – one of the most prolific UI libraries just got even better. Start prototyping now with the latest Material Design 2.0 UI kit for Android! Introducing Justinmind’s all-new Android UI kit: Android Material Design 2.0. The Android library is now kitted out with all the latest features of Google Material Design 2.0, making your Android prototypes better-looking and easier to achieve than ever. Our latest Android UI kit, includes a fully shared widget library between both tablet and mobile prototypes. This means that you can use the exact same components for the tablet view that you can on the mobile. An extra layer of responsiveness has also been added so that widgets snap to fit each screen snugly. If you’re interested in designing and prototyping Android applications then download the Justinmind prototyping tool now and read on to learn about the latest library of over 170 up-to-date components including, screens, cards, icons, templates and layouts to help you along with your design process. Originally known as Quantum Paper, Material Design is an open-source design language created by Google in 2014 with Android touch screen devices in mind. It aims to create consistent and enjoyable experiences across all platforms for its users. Essentially, Material Design acts as an adaptable framework comprised of components, tools and guidelines which helps establish better collaboration between design and development teams, achieving best practices and consistency when it comes to UI design. This is because its main emphasis is on user experience. Central to good user experience is responsiveness along with clear, easy-to-navigate user interfaces. Material Design enables and calls for boosted responsiveness across all platforms, as well as providing a library of components with the end goal of achieving more intuitive and aesthetically appealing applications. Effective responsiveness means that users can seamlessly switch between one device or the other and still have the same experience at different resolutions with minimal inconvenience. Proper scalability of elements, consistent iconography, typeface, colors and adequate consideration for animations are among the features absolutely tantamount to consistent and responsive design. The fact that Material Design’s objects and motions are based on 3-dimensional design, imitating real-world physics and natural movement, creates familiarity and a sense of intuitiveness, effectively reducing cognitive load for the user. In that respect, Material Design further supports the use of animations and motion in order to reaffirm to the user that they are in control. This motion thereby acts as a sort of feedback with regard to the actions the user takes, adding to the real world effect which, not only creates a sense of immersion for the user, but also of familiarity. To further reduce cognitive load, it attempts to make apps, such as those used for email, more readable by building on fundamental principles of print design. Through proper use of white space padding, the authors behind Material Design intended to build the library based on the Gestalt Principle of Proximity, which states that “objects or shapes that are close to one another appear to form groups.” Elements need breathing space. Why? Because adequate space attributes more focus to that element and it can also highlight a group of elements’ relationship with one another, distinguishing them from other groups. This effectively renders an app as more intelligible and usable. Download Justinmind and Start prototyping with Android Material Design 2.0 now. Special attention is also given to structural grid layouts as well as baseline grids for text in addition to colored elements, clear icons, and buttons with depth. In this way, the user is presented with content that is not only coherent, but more pleasurable to use and easier to navigate. What’s in Material Design 2.0? The updated material design UI kit brings with it a brand new user interface library with screens, material design templates and components that are up to date with the latest web and app design trends. The simple aesthetic design from Material Design 2.0 stems from the constant uptrend in mobile browsing and the need to have websites readily easily viewable on mobile platforms without sacrificing design. What you get with the Android Material Design 2.0 UI kit is a fully responsive widget library with 170 bold, graphic elements and components that automatically resize to fit any device screen, be it a tablet, or a mobile, by simply dragging it above the canvas. Additionally, for components that aren’t designed to fill the whole screen, such as a Horizontal softkey bar, they will automatically snap to the left or to the bottom of the canvas when dragged across. Once resized, you can lock a component into place or render it invisible while you edit. This also ties in with the fact that both the mobile and tablet libraries are fully fused, meaning that components that are specifically for tablet screens can resize to fill a mobile screen and vice versa. Improved efficiency is the pinnacle of what our Android Material Design 2.0 UI kit is all about. Groups together the screens with the most similar attributes, in this case being lock screen templates, maps navigation screens, menu backdrops and a music screen. Composed of photo album screens, Google Play Books, Google Drive, drawer screens, contacts, chat and call screens. Elements that can contain content and actions that separate different topics. In this category, the templates range from books, music and weather to simple generic templates for small, medium and large. Simple one and two line banners with generic dialogs including inbox items, contact lists, alerts and more, as well as content blocks such as calendars and clocks. Contains a selection of input forms, floating labels, the typical sliders, spinners seen in many Google apps as well as various Gboard layouts. Groups together all the latest menu designs, search headers and actions bars with the typical Google menu icons such as “like”, “download”, “share” and many more in addition to menu and floating actions button combinations. Every type of floating action, checkbox and action chips you might need, all with the latest design features – a particularly effective means of guiding the user’s focus is the use of the floating action button, uniquely characteristic of Material Design and which deploys shadowing to give flat interfaces an added sense of depth. Lists all the various possible tablet screens that may differ from a cell phone device such as title and lock screens as well as Gmail and Contacts view. It’s worthy to note here that any of these screens can also be used for mobile device prototyping if you so choose as the library is shared. Get Justinmind and discover the new Android Material Design 2.0 UI kit now. Perhaps the most striking feature of the new widget library is the minimalist approach it takes to design such as smoother pastel colors with lighter tones, round instead of angular edges and abundance of padding with plenty of white backgrounds. In addition to this, bars, sliders, spinners, scrollers and other icons and buttons all have a simple, clear design. Shadowing features heavily in this library, adding an extra layer of depth to each component. What can you do with Android Material Design 2.0 in Justinmind? 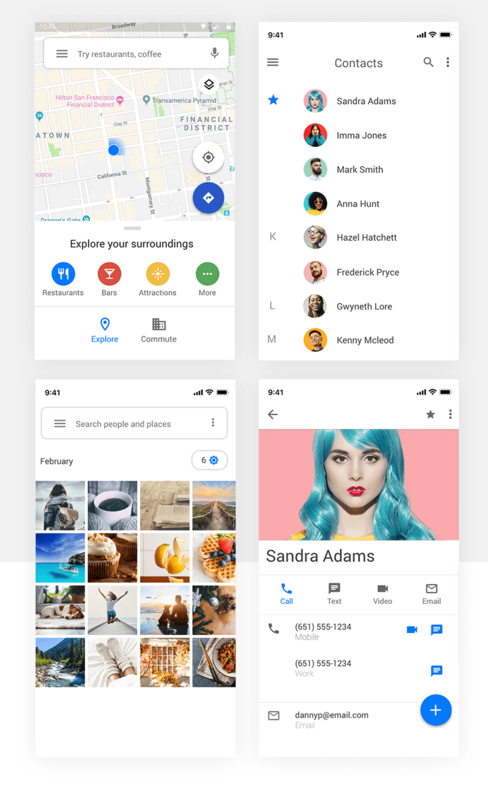 As well as an up-to-date, trendier design, you’ll find some extra changes to our Android Material Design 2.0 UI kit that, frankly, just make life a lot easier! Among the most significant changes is that the widgets from the new library can automatically resize to fit the canvas. Not only do widgets have the ability to resize, but some events such as basic motions are also automatically added to speed up the process, such as parent buttons that already work in simulations. In the example below, two Navigation drawers were dragged and dropped from the widget library onto the canvas. One of them (the menu) now appears outside the canvas to indicate that it is an extra panel that will open in that screen of the app. Now if we hit the simulation button to test our prototype and click on the hamburger menu, it will open the overflow menu without the need to add an interaction. This new feature can also be seen with other widgets, such as with the Maps backdrop. With this powerful widget, you just add it to the canvas and hit simulate. You’ll notice that if you click on the tab button above “Explore your surroundings”, the card expands into a dynamic panel with extra cards for points of interest. In this case they are place suggestions, but of course, they can be edited to suit your app’s needs. An additional handy feature of the new library is that text fields can now actually be used in simulations. Now if you’re designing screens that involve text being entered, be it a note-taking app, a browser, a sign in page or an email like in the example below, all you need to do is drag the text field Input, Floating label or Text area widgets to the canvas and simulate the prototype. You’ll see that you can already start entering text without actually having added the interaction. In the email example below, the text fields are already in the widget. Another really neat feature that comes with our update is that components such as the typical Android Sliders, Spinners, and Stars rating are also interactive when simulated. The spinners already have motions assigned to them and stars and sliders can already be manipulated. The fact that these basic motions are already added to many of the widgets in the library really helps speed up the process of designing your Android prototype. Now that the smaller things are taken care of, it’s easier to focus on the main motions that your prototype will have. The new design language is even more geared towards brand expression, and apps which are influenced by this new design generally have a clear and simple layout that is visually pleasing and doesn’t overload the user. Material Design 2 was introduced to tackle one main problem: the fact that the app design process was principally restricted to stringent guidelines concerning consistency. Google’s new mission was set out to develop a model whereby its original consistency could be maintained, while also allowing for unique brand-related design within the app. Developers now have a new Material Theme editor, as well as a tool suite to let them make their own customized designs. For prototyping, this means having more freedom to utilize Material Design’s library to create custom designs that more closely represent an organization’s brand identity. This in turn allows prototype designers the freedom to tweak the aesthetics in order to fully embody the brand presence of the organization while, at the same time, building an app that reflects the natural laws of the real world. The Material Design website’s guidelines state that color should “be applied throughout a UI consistently and be compatible with the brand it represents.” And by compatible, we mean that it should send out the right messages about your brand, as color has been proven to psychologically affect how a user perceives not just your app, but your brand too. You should therefore carefully think through any primary and secondary colors you want to use that, not only represent your brand but also your users experience, and display these throughout the app for consistency. For the primary color, distinction can be created between different elements by using the various accents of each color for contrast, such as dark purple for the top bar and a lighter tone for the system bar. The secondary color can be used to provide further accents and tones, in addition to drawing attention to call to actions or distinguishing floating action buttons, progress bars and sliders. You might also want to consider choosing at least one color that doesn’t represent your brand to use for error messages. Whatever the reason for choosing your colors, they should always be intentional. Colors can be just as powerful as padding when it comes to demonstrating the relationships between different groups of elements, as well as for devising a visual hierarchy. According to Roma Shah, Material Design “involves applying basic, natural laws from the physical world” that revolve around motion and lighting. Therefore, interactions are the key to creating an intuitive experience for your user with android. Not only will motion make a UI easier to navigate but, much in the same way as color, it can also help to reinforce your organization’s brand identity and character. In fact, even simple microinteractions can help make a real impression on your users. Apps such as Facebook and Instagram are shining examples of this with their hearts and thumbs-up buttons. Motion adds an intuitive level by highlighting relationship hierarchy between different elements and helps to improve the user flow by guiding them through the experience. A good example of how hierarchy is highlighted is through parent and child elements. Let’s take the typical menu icon as an example – when the user taps it, it leads them directly into the menu panel. This clearly demonstrates that the menu is the parent element and the actual menu is the child element. There are, however, two very important things you should keep in mind while implementing motion into your design plan: that it should always imitate real-world physical movement and that it should never be overdone – too much motion can overwhelm the user and cause them to lose track. Cards, in their essence, are surfaces like pieces of paper that stand out from the background, usually with the use of shadowing and feature content focused on single topics. They can be seen everywhere, from food delivery apps and maps, to interior design websites. They are also a common feature on dashboard-based interfaces such as performance apps. The use of cards in web and app design is quite a common occurrence and with good reason. This is because, in addition to being more visually appealing and interactive than simple lists, they’re an excellent solution to breaking content down into more digestible chunks. With this method, content blocks can be represented clearly. They can be expanded in a way the user can quickly find or choose the information they want. They’re also great way to implement motion into a screen. While tapping is the main gesture used for cards, others real-world actions such as swiping, scrolling and pick-up-and-move can also be integrated. The main rules to remember when designing your cards are that any gesture that is to be used within a collection of cards should be consistent. You should also ensure that your cards contain information that can be easily scanned, with elements such as text and images arranged in a hierarchical fashion. It’s clear that our Android Material Design 2.0 UI kit has a lot to offer to any type of app design and the new and updated widget library is a goldmine for devising any new prototype. This library of responsive widgets and components with basic built-in reactions will save you time as well as help your prototype shine.